Hello there! 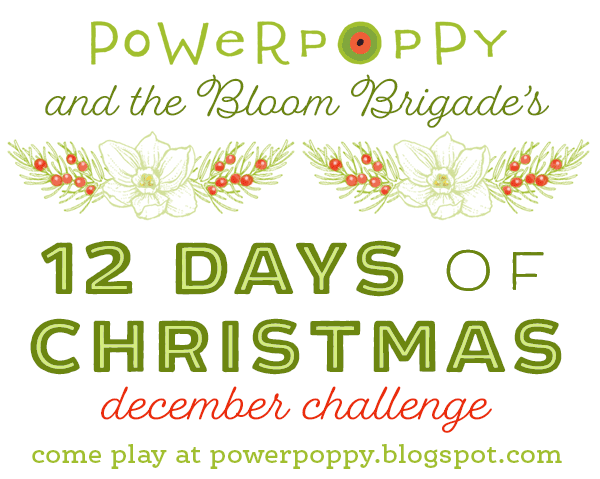 It’s Christine here and I am excited to be joining in on Power Poppy's December Power & Spark Challenge with our Twelve Days of Christmas twist! As visions of sugar plums dance in your heads, is the paper still flying in your crafting spaces? If you love to put a colorful and personal spin on your holiday creations, we love to hear it and we’re here to help! 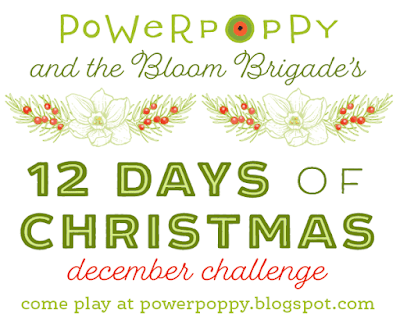 For the next week and a half, get ready for Power Poppy’s festive and fun take on the 12 Days of Christmas – a time to get inspiration to deliver that homespun charm not only to your loved ones but around your home as well. Each day the Power Poppy designers will be sharing ideas on all kinds of projects from home décor to accents for your holiday dinner table to ideas on how to package up those holiday goodies with style! 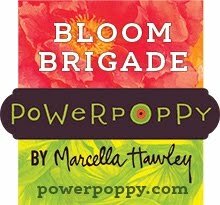 $50 shopping spree to the Power Poppy Shop! 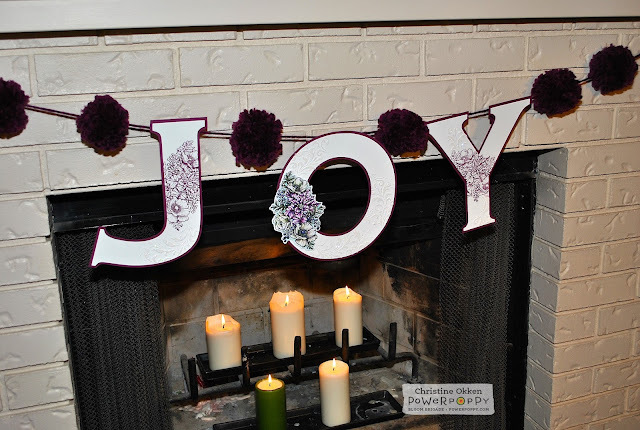 Here on DAY SIX, I’ve chosen to create a garland for Christmas to decorate a mantle. 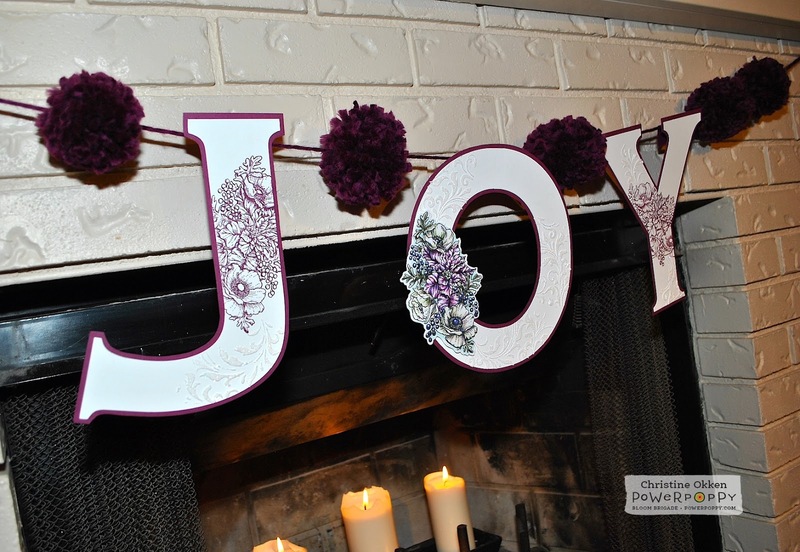 As I was dreaming up some ideas I decided to make my garland a little whimsical and add some homemade pom poms to the garland as accents, which I’ll also show you how to create on the Power Poppy Blog. Here’s a peek at what you’ll find there, using the lovely new Winter Wonderland set. I’ve taken a couple of pictures of the garland outside, where the light was a little better and then where its hung underneath our mantle on the fireplace where the lighting isn’t as good, but it gives you the idea of how it can be used. Here’s a peek at what the letters look like close up. I took a Tim Holtz Stencil (Flourish), some embossing paste and glitter and added some pretty sparkly dimension to the letters, giving it some time to dry. Funny story, in all my years of creating I’ve never spilled too much glitter, but on this project I accidently dumped a whole container of glitter everywhere. Let’s just say, “sparkle for days’. 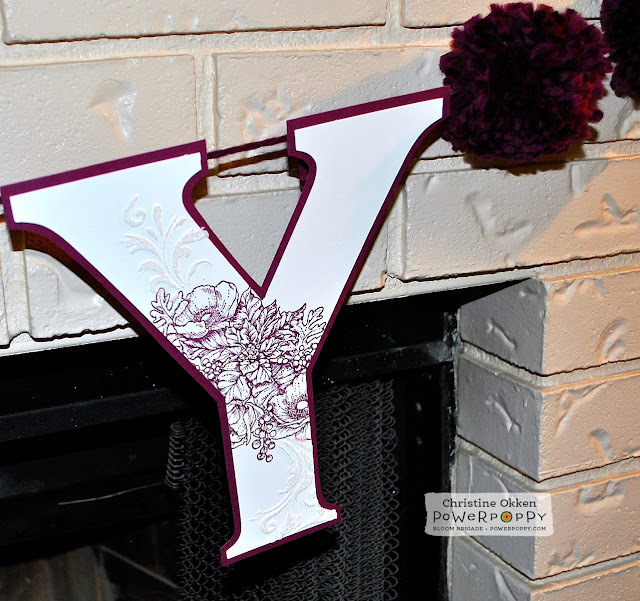 I gave each letter a border of Rich Razzleberry paper to give them a little more stability. For the O, after adding the sparkly dimension, I placed the spray of flowers on the left hand side of the letter attaching using foam dots. These next photos give you a bit of of better look a the colouring and the dimension in the spray. As beautiful as the stamp looks coloured, it’s equally as lovely stamped in a single colour because of how detailed it is. 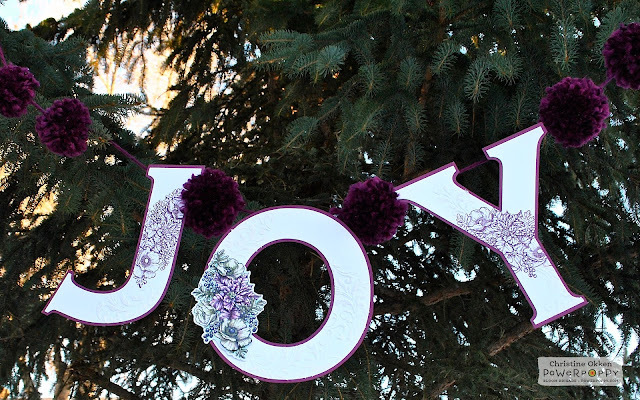 I also think it helps the garland from becoming too fussy by only adding one coloured up image. On the Power Poppy Blog I show you how to create the little pom poms between the letters and how I pulled it all together. Wishing you great JOY this season! Oh, Christine, I saw your post on the Power Poppy blog, and what a beautiful garland swag for the mantle. 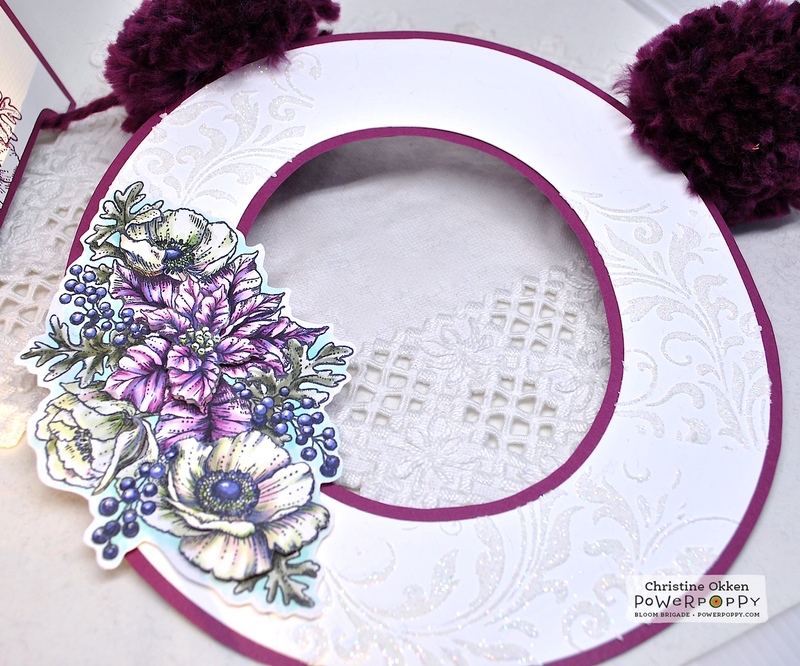 I love how you've used the stamps, and (as I said on the blog) I really want to learn to use my Silhouette better and get more comfy with it. Thanks for the inspiration. I love it!! Hugs! Christine, this is just gorgeous...elegant and yet those pom poems give it a little bit of whimsy too! I love your colors, too!! Sure the add so much coziness and be a keepsake treasure for years that come!! What a beautiful garland! You're right the stamp looks great either way! So pretty! !